The AgrAbility webinar Veterans in Agriculture: Military 101 is now archived at www.agrability.org/Online-Training/archived. See what's new in the Toolbox online this month. Check out Georgia AgrAbility on Facebook to stay abreast of their activities and recent fabrications: www.facebook.com/agrabilityinga. Indiana AgrAbility and the NAP are working with Purdue agricultural and biological engineering senior capstone project students to devise a reproducible mechanism for converting hydrostatic controls on John Deere lawn mowers to hand controls. This issue is one of the most frequent questions received via the NAP website and toll-free number. Amber Wolfe presented a session on the Indiana AgrAbility Project to the Indiana Farm Service Agency district directors at their annual meeting in Indianapolis on August 21. Staff also participated in other notable events including: the Minnesota State Fair 8/23/2012-9/3/2012, the Minnesota State Cattleman's Association Tour 7/10/2012, and Potato Days in Barnesville, MN 8/24-8/25 2012. Michele and Robin Tutor-Marcom from the NCAP partner NC Agromedicine Institute made presentations to local VR offices, various western NC agricultural affiliates, and the Special Populations Health Workgroup Meeting hosted by NC Community Health Center Association. Michele, Robin, and NCAP Advisory Board Member Cliff Sutton of NCDACS also attended a presentation by Amber Wolfe to the National Arthritis Foundation Mid Atlantic Regional Office in Charlotte on August 16th. The next NCAP Advisory Board meeting will be September 26th in Smithfield, NC. Oklahoma AgrAbility staff participated in a "Meet-and-Greet" Orientation for new Educators of the Oklahoma Cooperative Extension Service. 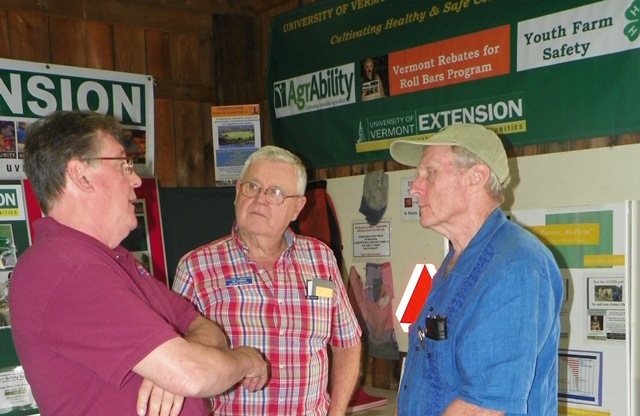 Tom Younkman and George Cook talked with folks during the Lamoille County Field Days to discuss AgrAbility and the many ways the program can assist farmers with disabilities. The one year anniversary of Hurricane Irene was marked by bells ringing at 7pm on August 28 to remember all those who were lost during the tragic storm of last summer. Some farms are recovering by adding acres of soil to lost fields and purchasing cows, other livestock, and equipment to replace the ones swept away in the flash floods. It will be many years until life, and routine, return to pre-Irene conditions. 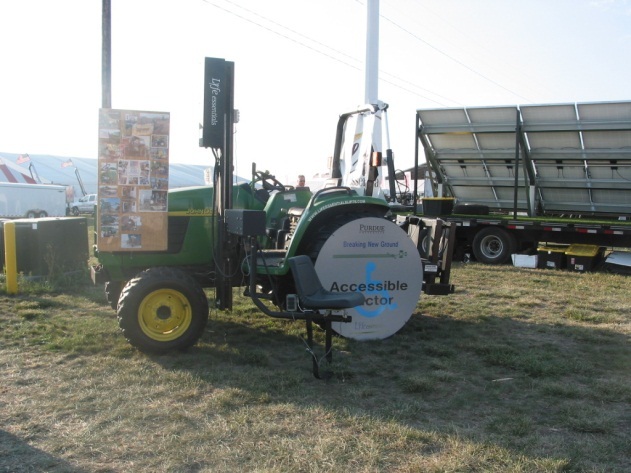 Wyoming AgrAbility has produced a third bulletin in the Solutions for Living Series titled, Solutions for Living: Personal Protective Equipment for Agriculture. 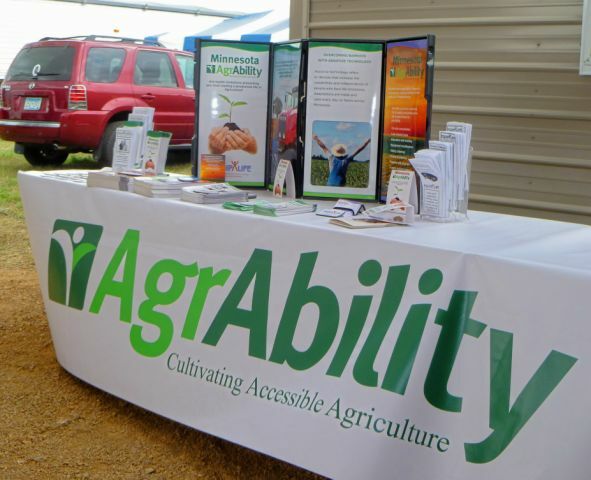 Wyoming AgrAbility shared information on reducing hearing loss in ranchers and farmers at the University of Wyoming's Agricultural Experiment Station field days in Lingle, WY in August. 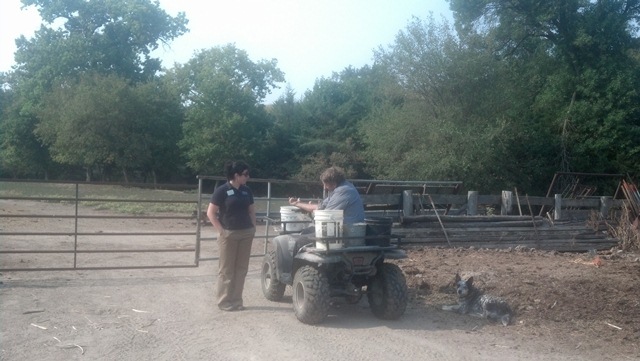 As of August 1, 2012, Maine AgrAbility has hired a new project coordinator: Lani Carlson. Lani has a BS in mechanical engineering and over 12 years experience in the environmental engineering and consulting industry, with a strong background in health and safety. In addition, she has over six years experience with her family farm and three seasons running her own CSA. She will be using her technical background combined with her passion for people and agriculture to make a difference in a Maine farmer's life that is affected by a disability or chronic illness. You can reach Lani by email at leilani.carlson@maine.edu or by phone at 207-944-1533. Thank you! 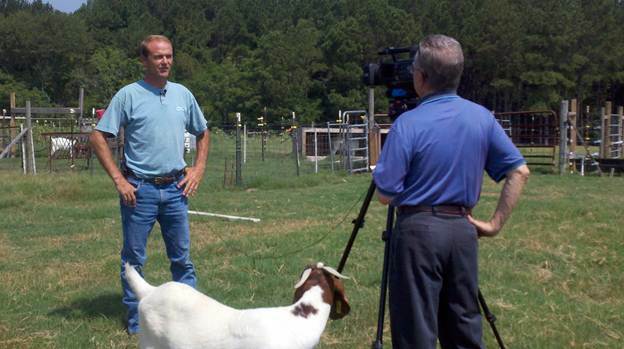 Welcome Diana Sargent and Tammie Honeyman as program assistants for Oklahoma AgrAbility. Diana provides front-line customer service with AgrAbility contacts and supports clients through the application process. She provides direct service resource and referral components of the project, and maintains data collection and reporting to all project partners and advisory council members. Tammie supports the project with disability-focused administrative detail and maintaining office procedures. Welcome Chelsea Lott as our new graduate research assistant. She is a first semester master's student in Human Development and Family Science.